2004 Monterey 322 2004 Monterey 322 - Generator 5kw - AC/Heat -Vacuflush Head - Sony 32" LCD tv - Windlass - Garmin GPS - VHF Radio - Cockpit carpet - Full Camper Canvas - Cockpit freeze - 2013 Loadmaster Trailer - More photos and details coming soon For more information and to schedule a showing please contact Jonathan.Kopija@marinemax.com (708) 275-3401. 2018 Monterey 360 Sport Coupe Adorned with cleverly designed seating, unlimited amenities and superior entertainment arrangements, both above and below deck, the 360SC is truly the first of its class. Our new 360SC Coupe features a masterfully designed helm station with dual electric sliding helm/companion seats, dual wet bars, located both port and starboard, and an open seating area with L-lounge and cockpit table. Below deck a luxuriously appointed cabin awaits you with generous accommodations, featuring a spacious v-berth which converts from a comfortable bed to a dinette and seating area with solid wood table, and fully equipped galley. Beautiful full windows adorn the interior of the cabin allowing you to never miss a moment while underway. 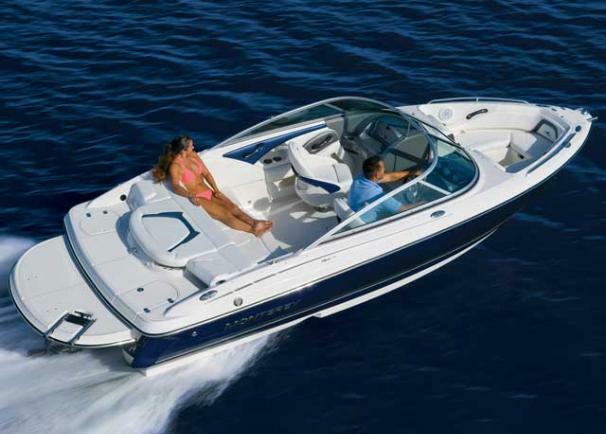 2018 Monterey 238 Super Sport Equipped with one of the largest sun pads in the industry for a boat of this size, the 238 is a sun worshiper’s delight! 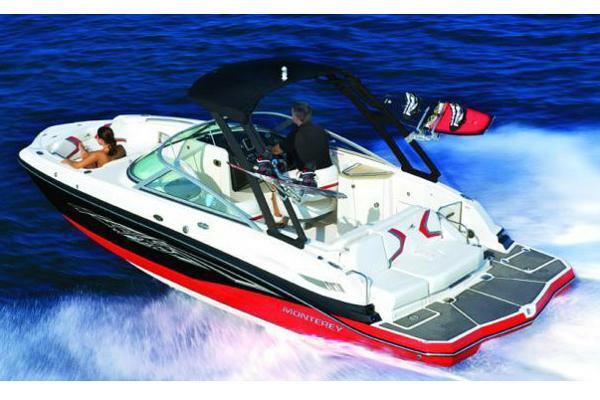 The sunpad also features the Monterey Signature flip up backrest for aft facing transom seating. The 238 also comes with Monterey’s highly popular trunk storage for all your accessories and gear.Speaking of seating, the 238 is also available with your choice of a portside bucket seat, or a multi-position flip up backrest that turns the port side seating into a massive chaise lounge arrangement maximizing available space! 2018 Monterey 197 Blackfin Ushering in a whole new era for Monterey, this mean multitasking machine is in a class all its own. The 197 Blackfin features port and starboard bucket seats, a built in cooler, and multiple storage options making it both roomy and functional. 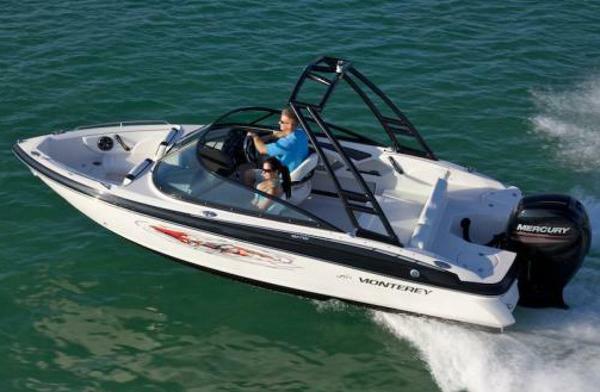 2018 Monterey 217 Blackfin Our new 217BF is ideal for wakeboarding, skiing, swimming diving and fishing and can be customized with a sleek black powder coated wakeboard tower. Standard features include a swim platform with a telescoping recessed ladder, and optional stainless steel ski-tow pylon. 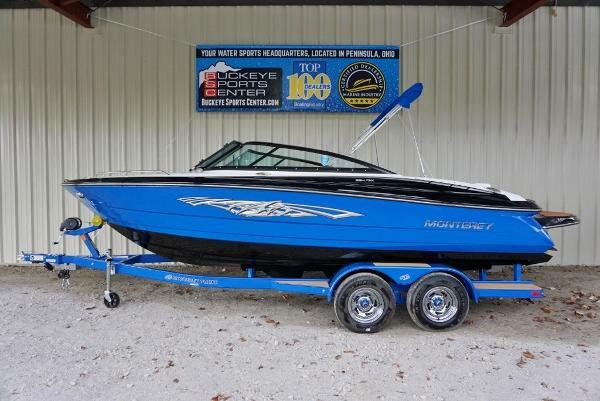 2018 Monterey M6 Our first model in the M Series of exciting, multi-usage sport boats, the Tri-tone gelcoat is standard or you can spice up your M5 with stylish M graphics, the choice is yours. Take the entire family out for a day of cruising, skiing, wakeboarding and tubing. You'll have all the space and amenities an active crew will appreciate like never before. The M5 is style, luxury and performance personified. 2018 Monterey M4 Nimble and Sporty best describes the Monterey M3. The smaller model in the M Series lineup, the M3 is still ahead of the curve. A standard wetbar is sized just right for preparing a drink, or a quick snack. The M3 is equipped with a stainless steel telescopic boarding ladder for easy access in an out of the water. A small head compartment is located behind the port side dash. The optional bow filler cushions turns the seating into a spacious sun island for taking in the rays. 2017 Monterey M6 A very modern, wide, deep 26' boat with one of the most unique and usable bow area's in the industry! Sit up to 4-5 in the bow! Also great layout at transom area! BLUE AND WHITE. 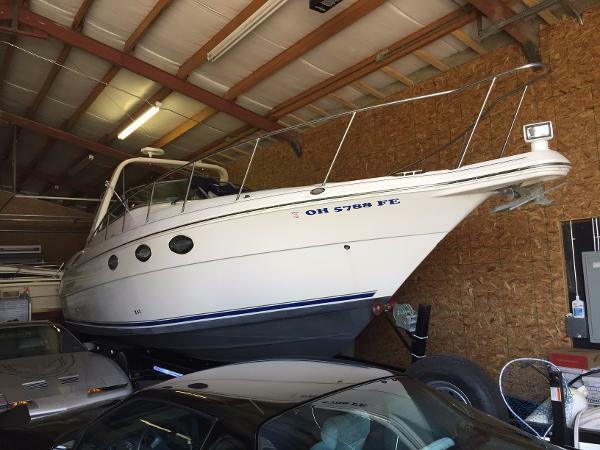 Includes Mercruiser 6.2L 300 HP Bravo 3 Duo Prop Engine, Custom Dual Axle Trailer, Seadeck Cockpit and Swim Deck Floor, Wake Tower, Covers, Table, Bow Filler Cushion, Port Flip Seat, Spare Tire, Battery Charger, Pump Out Head, Trim Tabs. Our first model in the M Series of exciting, multi-usage sport boats, the Tri-tone gelcoat is standard or you can spice up your M6 with stylish graphics, the choice is yours. Take the entire family out for a day of cruising, skiing, wakeboarding and tubing. You'll have all the space and amenities an active crew will appreciate like never before. The M6 is style, luxury and performance personified. 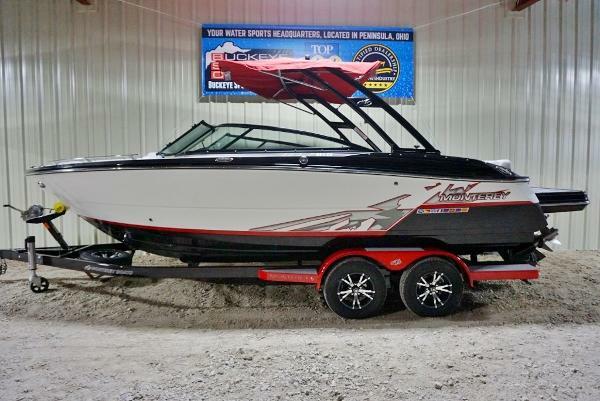 2017 Monterey 238 Super Sport SE Loaded up 23' Bowrider with Luxury and modern features! Includes Mercruiser 4.5L 250 HP Bravo 3 Duo Prop Engine, Custom Dual Axle Trailer, X-Pkg (Red Graphics and Upholstery Piping), Seadeck Cockpit Floor and Wake Tower, Covers, Table, Bow Filler Cushion, Port Flip Seat, Digital Dash w/Cruise Control, Spare Tire, Stainless Steel Package (Bow Ladder, Row Rails, Pop-Up Cleats, Docking Lights). The best-selling boats in the industry just got even better. 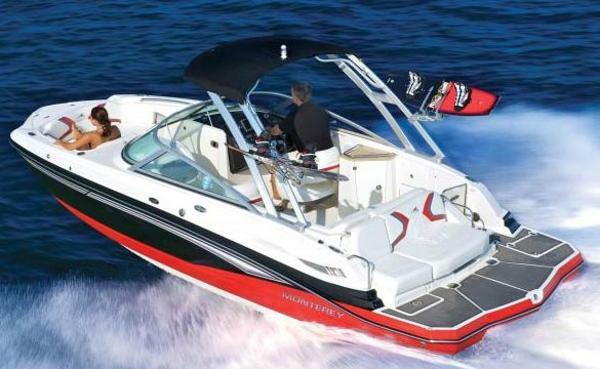 Monterey Boats has kicked into high gear, fueling your passion for water sports with a luxury performance surf edition. 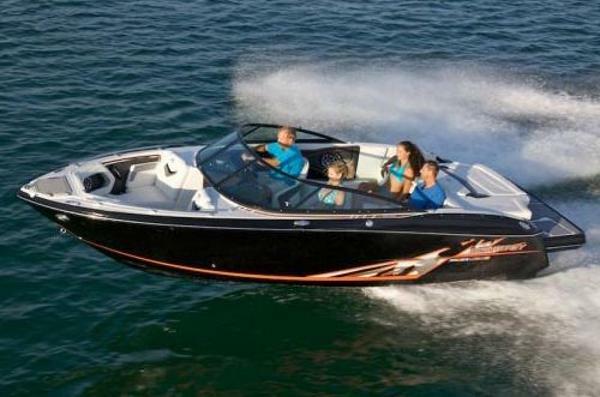 Our Roswell Surf Package option is available on both the Monterey 218SS and 238SS Super Sports; this option starts with an innovative helm design featuring one touch Zero Off GPS speed control, a high volume ballast system, collapsible wakeboard tower with cam assist, wakeboard/surfboard racks and surf tabs. Factor in the newly designed Roswell graphics, metal flake gel coat options, and specialized Roswell audio package and you have got a design that creates a perfect wake-surfing and wakeboarding experience. 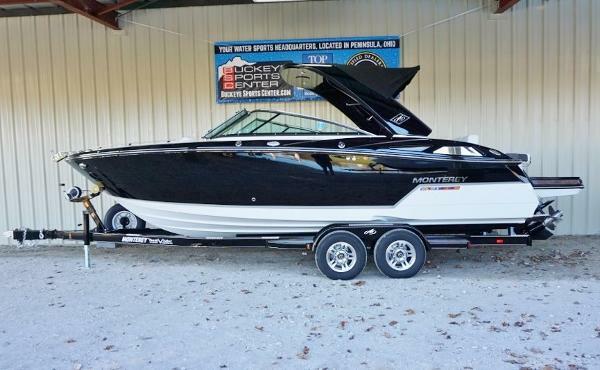 2017 Monterey 224FSX Hull Color: Blue/Black Features : Mercruiser 4.3L 220 HP Inboard/Outboard Options Included : Trailer, FSX Package (Black Deck, Black Hull Bottom, Black Windshield, Stainless Steel Package, Bow Ladder, Bow Rails, Docking Lights, Pull Up Cleats, Extreme Graphics) Bow and Cockpit Cover, Brown Sea Deck Flooring, Table, Arena Seating and Spare Tire. This power-packed 224FS will turn heads out on the water with Monterey's exclusive Facet Series styling and uncompromising beauty. 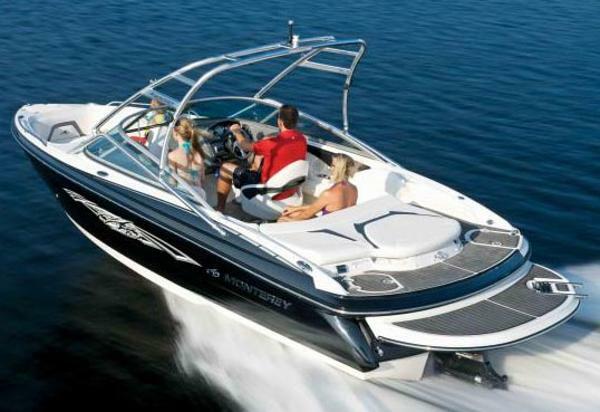 Attractive lines are complemented by infinite amenities while the optional recessed cleats and a sleek wraparound windshield make this boat look fast, even while it's docked. 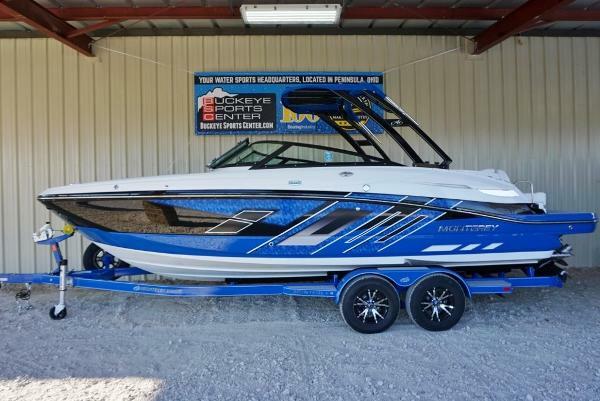 2017 Monterey 278 Super Sport A top of the line 27' Bowrider perfect for larger groups or deep water! Luxury Bowrider at it's Finest! BLACK. Includes Mercruiser 6.2L 350 HP Bravo 3 Duo Prop Engine, Custom Dual Axle Trailer (Trailer included but can be deleted), Digital Throttle and Shift, Windlass Automated Anchor System with Anchor, Seadeck Cockpit and Swim Deck Floor, Fully Automated Tower Arch with Bimini Top, Transom Stereo Remote, Pump Out Head, Bow Filler Cushion, Port Flip Seat, Spare Tire, Battery Charger, Raymarine A67 GPS unit, Trim Tabs. Sophistication, performance & endless possibilities. Taking your friends and family out for the weekend on the 278SS will quickly become a habit once you've experience all the amenities packing into this model. The 278SS is a streamlined beauty that performs like a bullet on the water. This beauty will turn heads around the dock, and feels like that favorite, comfortable chair that you adore. An optional sport arch can hold your wake-board and water-ski gear in style, while adding to the sleek look of the 278SS. Ample storage and seating help set this bowrider apart from the competition. 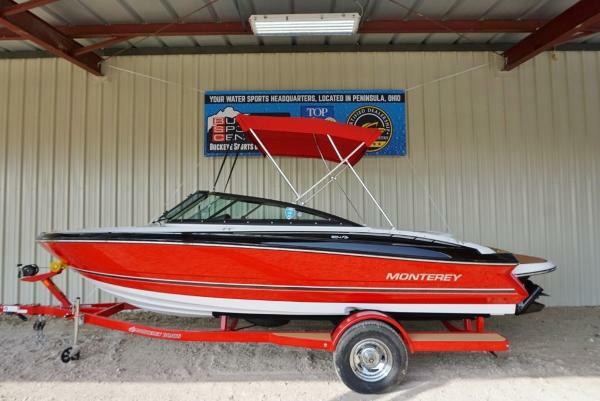 2013 Monterey 340 Sport Yacht Just In! 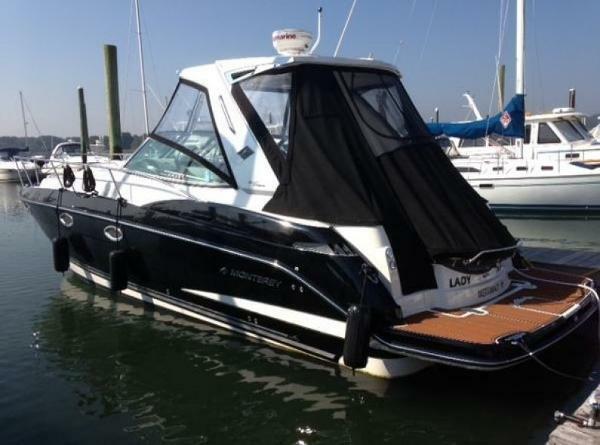 This 2013 Monterey 340 Sport Yacht looks like it just rolled out of the showroom floor. This has always been a freshwater boat and stored inside heated storage over the winter months. This boat is equipped with.. Twin 8.2 Merc with Axius (118hours) Black Hull and Deck Upgraded Stereo package Woven cockpit flooring Electronic Package (E97 VHF, GPS/Chart Plotter) Remote Controlled Spotlight Stainless Steel Anchor Silver Painted Hardtop Underwater LED Lights Brown Seadek Swimplatform 5.0kw Generator(22hours) 16000BTU AC/Revers Heat Cockpit TV Cockpit Refrigerator Call today for more details! The 340 Sport Yacht is one Monterey's most popular models. The right mix of its sleek design and well laid out accommodations make this a winning combination. Equipped with Monterey's exclusive Sun Island seating, you have three different options on how to relax and spend your day. Beneath the sun island is a finished fiberglass dunnage compartment that is large enough for all your lines, fenders, and power cords. On the underneath side of the lid is a dedicated holder for securely stowing the cockpit table.